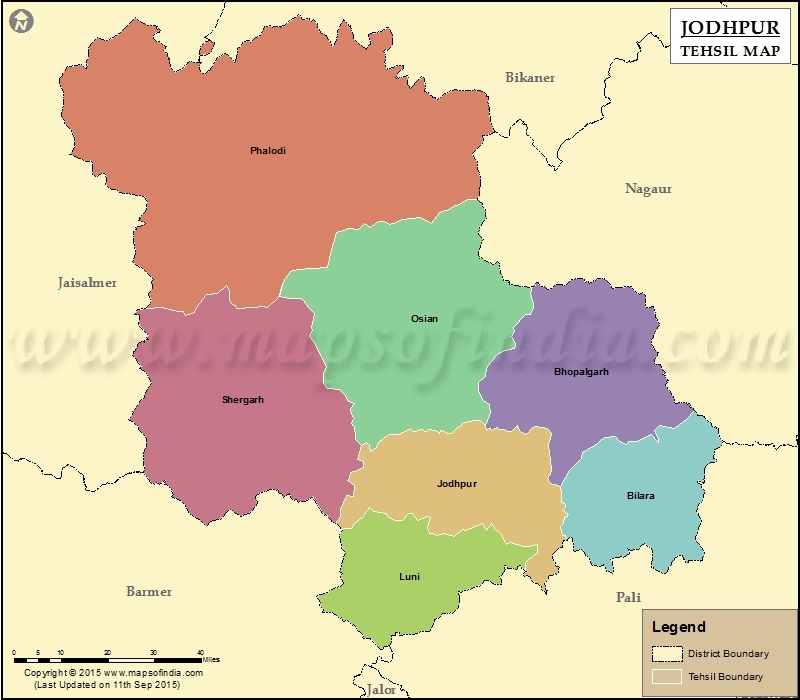 Jodhpur district is located in western part of Rajasthan, located between 26°00′ to 27°37′ North latitude and 72°55′ to 73°55′ East longitude. It shares common border with five districts viz., Bikaner, Jaisalmer in north and north west, Banner and Pali in SW & SE and Nagaur in E-NE. The district has a geographical area of 22850 sq. kms which is 6.60% of total area of the state and 11.6% of total arid zone of Rajasthan. It has been divided into Mandore, Osian, Phalodi, Bilara, Bhopalgarh, Shergarh, Luni, Pipar City, Baori, Balesar Bap, Lohawat, Tinwari. Image Source: maps of India, Only 7 Tehsils shown. The history of Jodhpur revolves around the Rathore Clan. Rao Jodha, the chief of the Rathore clan, is credited with the origin of Jodhpur in India. He founded Jodhpur in 1459. The city is named after him only. It was previously known as Marwar. After the destruction of the Gahadavala kingdom, and the migration of the Gahadwalas to Rajputana, a prince of the Kannauj kings founded the Rathore dynasty of Marwar in 1226. Rao Siyaji, grand son of Jai Chandra, of Kannauj, came to marwar during his pilgrimage to dwarka. His Son, Rao Asthan conquered Pali, and Khed (in western Marwar), but ultimately got killed in battle by Sultan Jalauddin Khilji of Delhi. Rao Chanda/Chundarji, 10th in succession from Siyaji, finally wrested control of Marwar from the Gurjara Pratiharas – and established rule of Rathores in Marwar. Jodhpur was the primary state of Rathores but different states (Bikaner, Kishangarh etc)were also founded by different Rathore rulers. Rao Chanda/Chundarji secured & found kingdom of Marwar. Rao Chanda, is killed in battle by Salim Shah of Multan. The king’s son, Kanha, subsequently has to fight to retain his throne when his brother Rao Ranmal. Ultimately, Ranmal succeeds. Reconquers Mandore from the Sisodiyas of Mewar (Rana Kumbha). Began Construction of Mehrangarh fort. Maldeo refused to ally with either the Sur Empire or the Mughal Empire after Humayun regained control of north India in 1555. In 1543, Battle of Sammel: with Sher Shah Suri – Maldeo lost. 3rd Son but Maldeo named him successor. Elder brother Udai Singh, sided with Akbar – Battle of Merta 1562 – Lost his territories in wars with the Mughals. He was defeated but refused to form any alliance with Mughals. Shah Jehan made him ruler, in line with his wishes. His son Prithvi Raj Singh – was murdered by Aurangzeb through poisonous robe. When Jaswant Singh died, he left no male heir. But 2 of his wives were pregnant. AJit was born later. However, Aurangzeb appointed Indra Singh as ruler. Durgadas went to Auranzeb to recognize Ajit singh as successor but Aurangzeb kept condition of converting Ajit to muslim. Durga das disagreed. For 20 years, Marwar remained under direct Mughal rule, Durga das continued stuggle. When Aurangzeb died 1707, Durga das seized occasion, Ajit Singh regained Jodhpur. Battle of Gangwan against Amber. Was defeated in battle by his uncle Bakht Singh at Luniawas, 27 November 1750 and was expelled from Jodhpur and sought refuge in Jaipur. Brother of Abhai Singh- defeated his son Ram Singh. Assists the British in India during the Indian Mutiny of 1857. Situated on a steep hill, Mehrangarh fort is one of the largest forts in India. 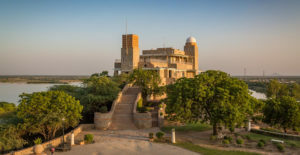 The beauty and the grandeur of numerous palaces in the fort narrates a saga of hard sandstones yielding to the chisels of skilled Jodhpuri sculptures. The fort is known for its exquisite latticed windows, carved panels, intricately decorated windows and walls of Moti Mahal, Phool Mahal and Sheesh Mahal. Moti Mahal, as the name suggests, is the Pearl Hall where the royal families held their audience. 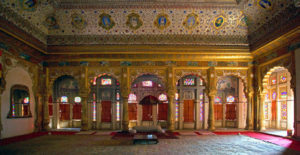 The hall is known to have glass windows and five nooks that enabled the queens to listen to the proceedings taking place in the Sringar Chowki, The Royal Throne of Jodhpur. Going by the name, the Phool Mahal or Flower Hall is the most exorbitant of all the halls in the palace. This beautiful chamber is said to be the pleasure dome for the Maharajas. The gold used for constructing the Mahal came from Ahmedabad, Gujarat. Located 85 kilometres from the main city, the 400-year old Khejarla Fort is situated in a rural setting. 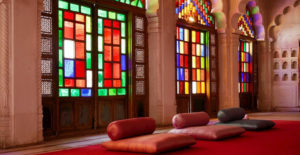 The stunning red sandstone monument, now a hotel, is an example of Rajput architecture. Visitors will be mesmerised by the fort’s picturesque settings, latticework friezes and intricate Jharokas. 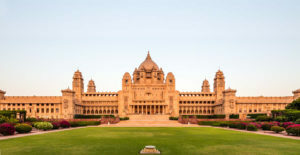 Umaid Bhawan Palace was built by Maharaja Umaid Singh in 1929 to counter a famine which had hit the state at the time. 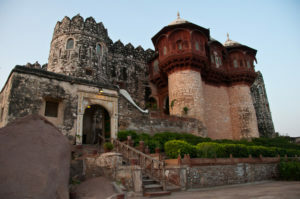 It was also known as the Chittar Palace while being constructed thanks to the use of stones drawn from the Chittar hill. The palace was designed by HV Lanchester, a renowned British architect, and was completed in 16 years. Built with sandstone and marble, the architecture of the palace is described as a blend of lndo-Saracenic, Classical Revival and Western Art Deco styles. It is recognised as one of the largest private homes in the world and also one of the more spectacular buildings. It is the only palace built in the 20th century. This milky white memorial built towards the end of the 19th century as a tribute to the leader Jaswant Singh is a huge tourist attraction. Jaswant Singh, who ruled Jodhpur, invested well in his state. He made attempts to bring down the level of crime, subdue dacoits, built railways and broadly worked on raising the economy of Marwar. 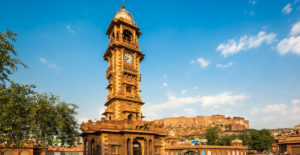 Ghanta Ghar, also known as the clock tower of Rajasthan, is situated in one of the busiest areas of Jodhpur, the Sadar Bazaar. It was constructed by Shri Sardar Singh Ji of Jodhpur. The Sadar Market is quite popular among tourists, who throng the streets to purchase Rajasthani textiles, clay figurines, miniature camels and elephants, marble inlay work and classic silver jewellery. Built on the banks of the Sardar Samand Lake by Maharaja Umaid Singh in 1933, the Sardar Samand Lake Palace is a spectacular hunting lodge. It remains the royal family’s favourite retreat and houses a vast collection of African trophies and original watercolour paintings. 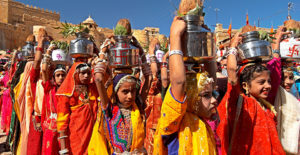 The Marwar festival is one the most famous festivals of Jodhpur and India. The two-day festival is held every year in the month of Ashwin (between September and October) and for one night in Osian Town in the Thar Desert, in memory of the heroes of Rajasthan. It was originally known as the Maand Festival. The Marwar festival is a centre of authentic folk music, culture and lifestyle of Rajasthan’s rulers. 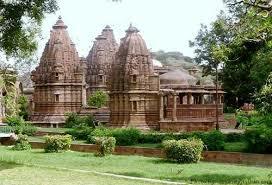 The festival is held at famous venues like the Umaid Bhavan Palace, Mandore and Mehrangarh Fort. It is organized at a place locally known as ‘Kaga’ in Jodhpur City. This fair to is held on Chaitra Badi 8(March-April) every year. Nearly thirty thousand people assemble in this fair to pay homage to the image of Sheetla Mata. 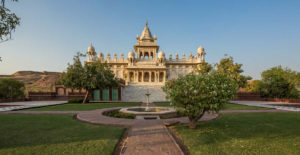 A fair is held at Mandore, which is about 8 kms from Jodhpur city, in the memory of the heroes of Rajasthan on the penultimate Monday of Shravana(July-August) every year. Offerings of cash, coconuts and sweets are placed before the idols of deities-Ganesh, Bhairon, Chamunda and Kankali. About fifteen thousand persons of all communities congregate in this fair. The hillock has been developed as a beautiful picnic spot. A fair is organized on Ashvina Sudi 10(September-October) every year at a place near Masooria hillock known as ‘Rawan-ka Chabutra’ lacs of people congregate here on this occasion. The Temple of Chamunda Mata is located in Jodhpur Fort. Chamunda Mata is the family deity of Rathors (the former rulers of Jodhpur State). A fair is held on Ashvina Sudi 9(September-October) every year. More than 50,000 people, who worship the goddess, congregate in the fair. This fair is held at a place known as Ban Ganga in Bilara town. It takes place on Chaitra Badi Amavasya (March April) every year. It is held in the memory of nine women who became sati at this place. More than 10,000 persons assemble in this fair normally to take a dip in the Ban Ganga River and also take part in singing and dancing. This fair is held at Jodhpur City on Bhadrapada Sudi 2(August-September) at Massoria hillock, where the temple of Baba Ramdeo is situated. A Large number of people gather on this occasion from various parts of the state. It is locally known as Massoria Baba Ka Mela. The region comprises three distinct physiography units, namely, the alluvial plains, Escarpments and Ridges and Sand dunes. Land surface of the district is nearly flat and sandy with exception of some parts of Bilara and Osian Tehsils. The western & north-western parts of district are characterized by sand dunes. Sand dunes of transverse, longitudinal and parabolic variety are present and attain a height of 10 to 40 m.
There is only one important river in the district, viz., Luni, which enter the district near Bilara and flows for a distance of over 75 kms. before entering in Barmer district. The climate here is of extreme desert condition of scorching summer with hot dry winds and arid conditions. Phalodi is the hottest place in the district where in summers maximum daily temperatures varies between 40°C to 45°C. Occasionally, it rises to 49°C. The winters are quite chilly. From rain fall point of view, district has two distinct zones i.e., the NW part has 20-30 cms. average rain fall while SE part has 30-40 cms. average rainfall. This rainfall mainly occurs during late June to September. 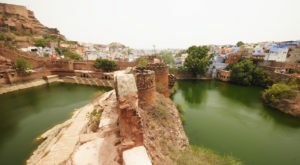 Located near the Fateh Pole in Mehrangarh, the Ranisar and Padmasar are adjacent lakes that were constructed in the year 1459. Ranisar Lake was built on orders of Queen Jasmade Hadi, Rao Jodha’s wife while Padmasar Lake was ordered by Queen Padmini of Rao Ganga, daughter of Rana Sanga of Mewar. Situated on Jaisalmer road, this small artificial lake is an ideal picnic spot. It is like a canvas with a splash of romantic colors. The beauty of the lake stays with you long after you’ve experienced it. 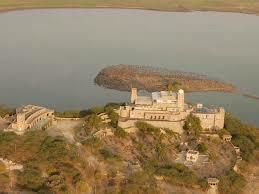 Balsamand Lake is about 5 kilometres from Jodhpur on the Jodhpur-Mandore Road. Built in 1159 AD, it was planned as a water reservoir to cater to Mandore. The Balsamand Lake Palace was built on its shore later as a summer palace. It is surrounded by lush green gardens that house groves of trees such as mango, papaya, pomegranate, guava and plum. Animals and birds like the jackal and peacock also call this place home. The lake attracts several migratory and local birds such as the yellow-legged green pigeon, Himalayan griffon and Dalmatian pelican, making it a bird watcher’s paradise. Jasper is silica having dark red colour. It has been found to be a good abrasive and is used in making grinding wheels. Jasper occurs near Mathania, Osiyan, Rundia, Sopra, Mogra, Lawera and Tamtia. Dolomite having high MgO with low silica percentage is a valuable industrial raw material for steel, refractory, glass and ferromanganese industries. Dolomite/dolomitic limestone occrrences are mainly confined to an east-west trending zone between Phalodi and Nagaur. Indo Ki Dhani & Indolai Ka Talao area is associated with siliceous dolomite. Good ball clay is reported from northern part of the district in tehsil Phalodi near village Kanasar-Mandli. It can be used in ceramic, rubber & paint industry. This is an important building stone of whole of Western Rajasthan. History of its mining in Jodhpur district is 500 years old. Temples and Palaces in Jodhpur area are ample proof of sandstone’s utility. The important occurrences of sandstone are located around Jodhpur city viz., Mandore, Soor-Sagar, Keru, Berli, Kailana, Balesar, Dechu, Setrawa, Chokri, Ratkudiya, Osiyan, Bhopalgarh etc. Handicraft items made out of sandstone are exported in international market. This mineral finds multiple uses in variety of industries like cement, chemical, steel, sugar etc. There are number of limestone belts of cement to chemical grade occurring in Western Rajasthan, located in Jaisalmer, Jodhpur, Pali and Nagaur districts. Out of these most important are Sojat-Bilara-Gotan-Mundwa & Jaisalmer belts having cement-chemical grade limestone. Part of Sojat belt passes through the eastern part of Jodhpur district. The important localities are Bilara-Ransigaon, Hariya Dhana, Borunda etc. Small occurrences of limestone are also observed near Basni Had Singh, Suwana, Basni-Darmi and Asop villages of Bhopalgarh tehsil. Granite in Jodhpur district is scattered over 150 sq. kms. area around Pipar, Khejarla, Chokri, Salawas, Madliya, Rawniana, Kosana, Kharia etc. Colour varies from grey, pink, cream to red-brown. Jodhpur Granite has been classified as plutonic equivalant of Malani rhyolite. Extrusive phase of Malani suite occupies large part of Jodhpur district. 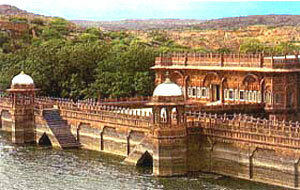 The important localities around Jodhpur are Kailana, Fort and Lalsagar. Rhyolite is mainly used for making road ballast, gitti and chips and powder. Low grade red-yellow ochre is found associated with sandstone near Pichiyak in tehsil Bilara. It is used for white washing of houses, floor, walls etc. Only one mining lease of brick earth is sanctioned in Kiron Ki Dhani. Borunda, Ghati, Bujhawad, Daizar, Gangana, Rohilla Kalan, Sar (Sawri-Bhakri) etc. are main localities from where masonry stone is produced. In addition to the above, recently department has located new areas of masonry stone near Osiyan, Tinwri, Bhopalgarh, Daizar etc. Salt occurs in form of brine solution near Malar-Bap area in north of Phalodi. 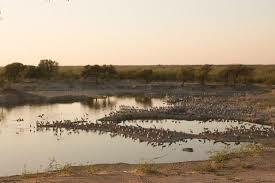 Water is pumped out of wells and is spread in small shallow ponds and Salt is collected by evaporation method. According to the 2011 census, Jodhpur district has a population of 36,85,681. Its population growth rate over the decade 2001-2011 was 27.69%. The district has a population density of 161 inhabitants per square kilometer.